A bit lost with all these acronyms? Here are key points to understand this ongoing process. The next Framework Programme for Research and Innovation (FP9) is expected to launch on 1 January 2021 and to cover the period 2021-2027. The aim of this framework programme is to support and foster research in the European Research Area (ERA), however specific objectives and actions vary between funding periods. 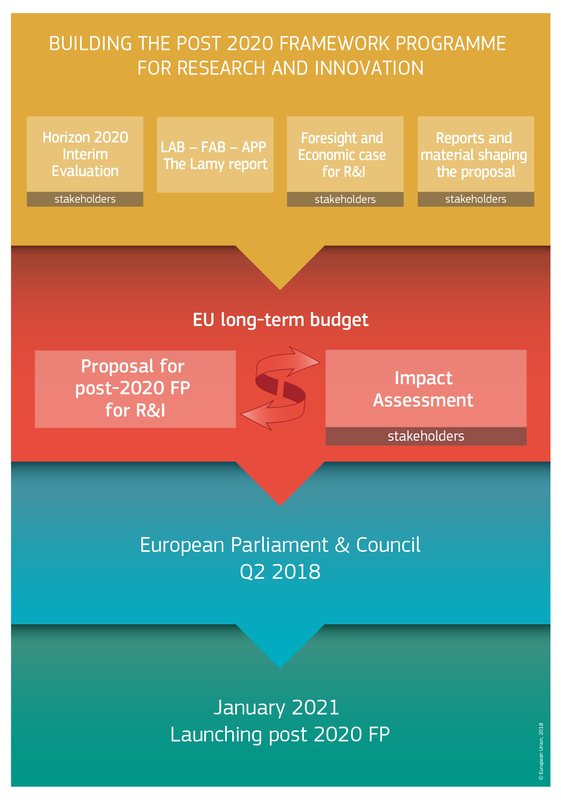 The initial proposal of the FP9 is being prepared and written by the European Commission on the basis of various discussions and reports such as the interim evaluation of Horizon 2020, the Lab-Fab-App report (also called "Lamy report") and other foresight studies. The Council and the European Parliament, on the basis of the European Commission proposal, will have to find an agreement on the FP9 proposal following the ordinary legislative procedure (co-decision). At the European Commission: The Commission writes the first proposal. At the European Parliament: your nationally elected representatives (MEPs). MEPs examine and negotiate the Commission's proposal. At the Council of the European Union (often referred to as 'the Council'): government ministers from each EU country, according to the policy area to be discussed (in our case, Ministers with Research in their policy portfolio). The Council also examines and negotiates the Commission's proposal. The next framework programme will incorporate research and innovation missions to ensure the effectiveness of research and innovation funding by pursuing clearly defined targets. To do so, the Commission has recruited policy experts including Prof. Mariana Mazzucato to advise the Commission on how a mission-oriented policy approach would work. You can read her whole report here. And Ecsite in all this? We have just released a position paper that states that FP9 should push traditional boundaries and actively involve citizens in the science and innovation process. Ecsite is dedicating strategic advocacy resources to make the voice of science engagement heard in this process, an effort the Ecsite Board and members are personally committing time and energy to. More here.